Saratoga, CA – October 10, 2017 – Gilbane Building Company, a national leader in construction management, was happy to celebrate a major milestone at the site of the West Valley College Student Services Center project in Saratoga, CA. 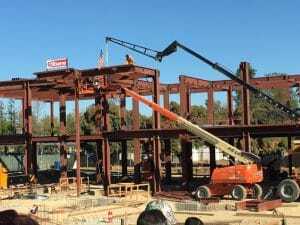 The steel topping off ceremony was attended by representatives from West Valley – Mission Community College District, college staff, and representatives from Gilbane and key contractors. Gilbane is providing Construction Management and as-needed Program Management services for the construction of West Valley College’s new 36,000 SF Student Services Center building. The project involves the replacement of the existing Admissions & Records and Counseling buildings, and will consolidate student services functions under one roof. The new building will allow for replacement of two outdated permanent buildings and two portable buildings. The two-story facility will house Counseling, Admissions & Records, Disability Education Support programs, Extended Opportunity Services and programs, Learning Services, and Health Sciences. “The Student Services Center will be the heart of our efforts in promoting student success. We appreciate the efforts of our colleagues at Gilbane to help keep this project on track,” said Bradley Davis, President of West Valley College. “It took just over a year and a half of hard work and determination to hit this milestone and the Gilbane team looks forward to continued success working with the District’s team, design team and contractors’”, says Kevin Eckels, Project Manager with Gilbane. Gilbane provides a full slate of construction and facilities-related services – from pre-construction planning and integrated consulting capabilities to comprehensive construction management, general contracting, design-build and facility management services – for clients across various markets. Founded in 1873 and still a privately held, family-owned company, Gilbane has more than 50 office locations around the world. For more information, visit www.gilbaneco.com.For more information, visit www.gilbaneco.com.